2 avocados, pitted, peeled and either sliced or chopped. Stir together sour cream, mayonnaise, lemon juice, basil, salt, pepper and garlic powder until well blended. 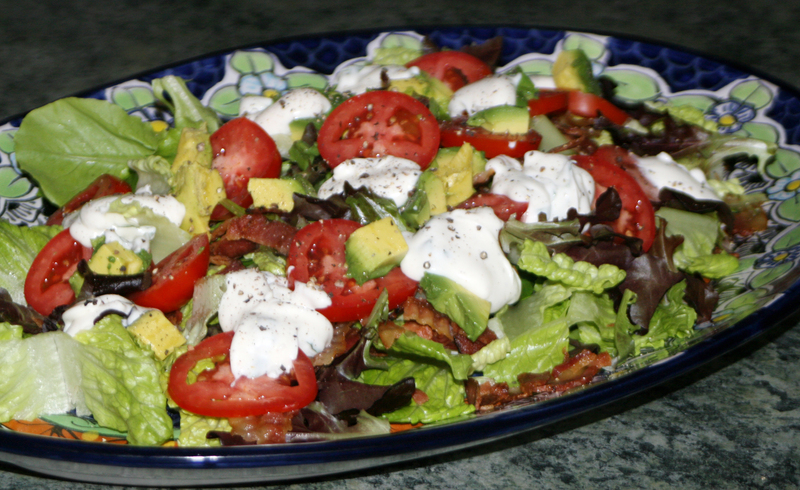 Layer lettuce, bacon, tomato, and avocado in a wide shallow bowl, or large platter. Drop mayonnaise mixture in dollops evenly over avocado. Cover and chill salad at least 2 hours. *Author’s Note: This is really beautiful presented untossed. I prefer for guests to see it in its glorious layers, and then serve it or toss it in front of them! This entry was posted in Salads and tagged BLAT, BLT, Fresh Tomatoes, Lobster Roll by Peg. Bookmark the permalink.